On instagram I see now a lot of oval shaped make-up brushes almost everywhere… I hope that you know what I mean, because these brushes are a real hype. And you know that for sure when you can find such brushes in the action. Then action either jumped early on this trend or I’m a bit late with this trend. And I think that it will be the last part… But that didn’t kept me from buying these brushes. Because maybe there are not that over hyped and these are just awesome make-up brushes? Action promise that these brushes are perfect for blending and that the brushes are special soft nylon ones. The brushes must work fast, easily and are soft for the skin. Sounds like music in my ears and also like the perfect make-up brush collection. They are easy to use; you must blend softly or in circular motions. For eye makeup, eyebrows and concealer. For doing your eyebrows and eye makup is this brush not that perfect. The brush is very small but the hairs are very flexible and that is not perfect to create tight eyebrows… So no I don’t think that, that is going to work. But this brush is perfect to contour your nose. Because this one is so small, you can work very precisely. Here from are the hairs standing to close to each other and I don’t like that for bringing on powder makeup. But for my concealer or cream highlighter is this one just perfect! 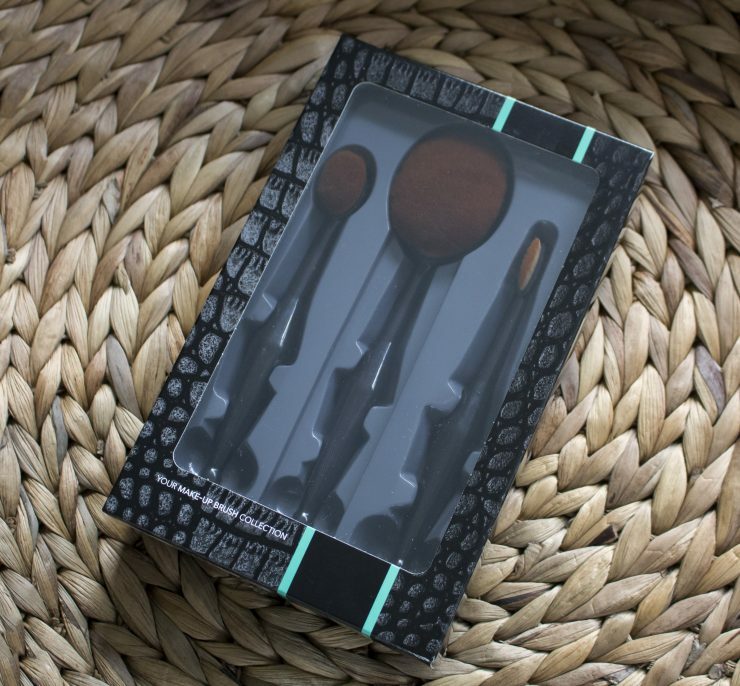 It’s the perfect brush to bring on liquid makeup products! It helps to blends it perfectly into my skin! For foundation, shaping, contouring, blushing, storbing and bronzing. All the brushes are very soft and lay good in your hand. My personal favorite from the three is the medium oval shaped brush. They all work good and give you a pretty result. I only regret that I need more foundation when I use the large brush. But that is the only thing because for the rest are these brushes amazing! You can find the ‘your make-up brush collection’ in the action for €3,95 that’s €1,32 for a brush. And that’s for sure a good deal! These brushes look so strange but I know people that use them and they’re really happy with them! Ja vond ik ook… Maar voor de rest zijn ze wel zeer fijn! De handvaatjes vind ik niet zo mooi maar de haartjes zelf zien er wel oké uit.